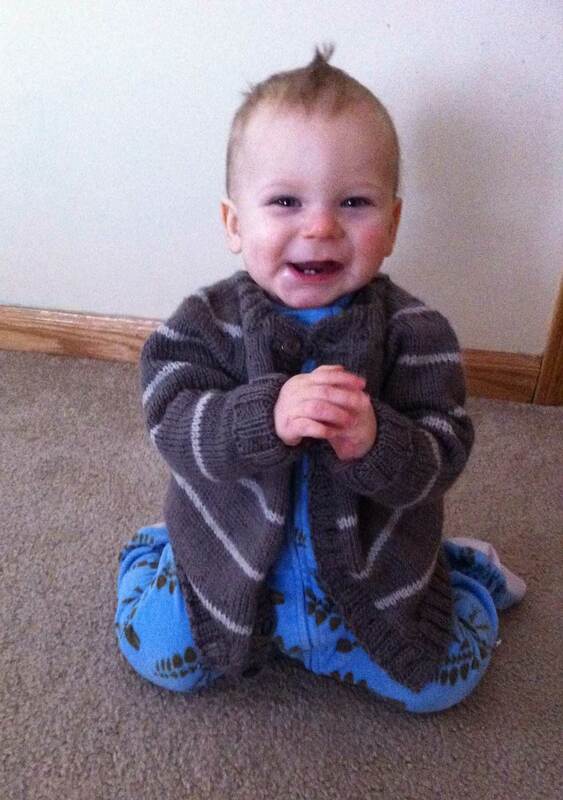 Other than a couple of pairs of baby booties, I had not knit anything for our grandson, who turned one year old last month. 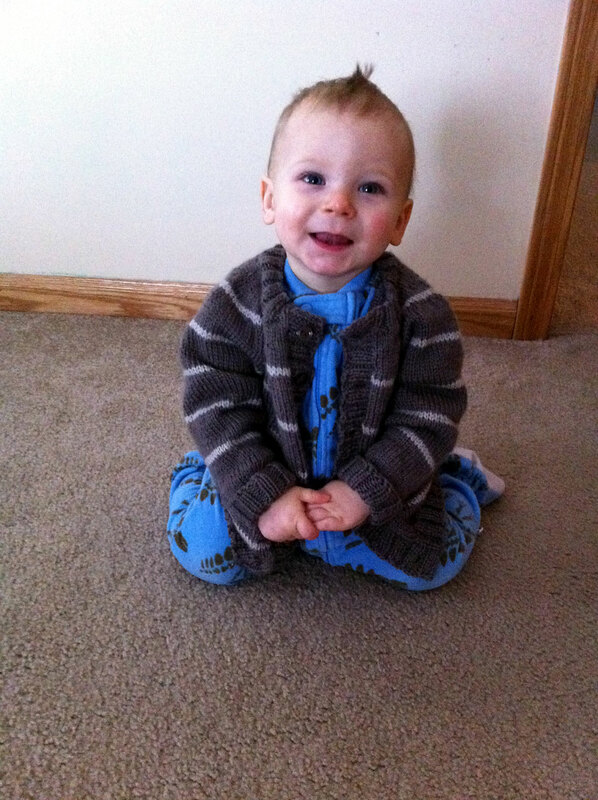 I knit sweaters for his twin sisters for Christmas 2013 and had enough yarn left over to knit a sweater for him. 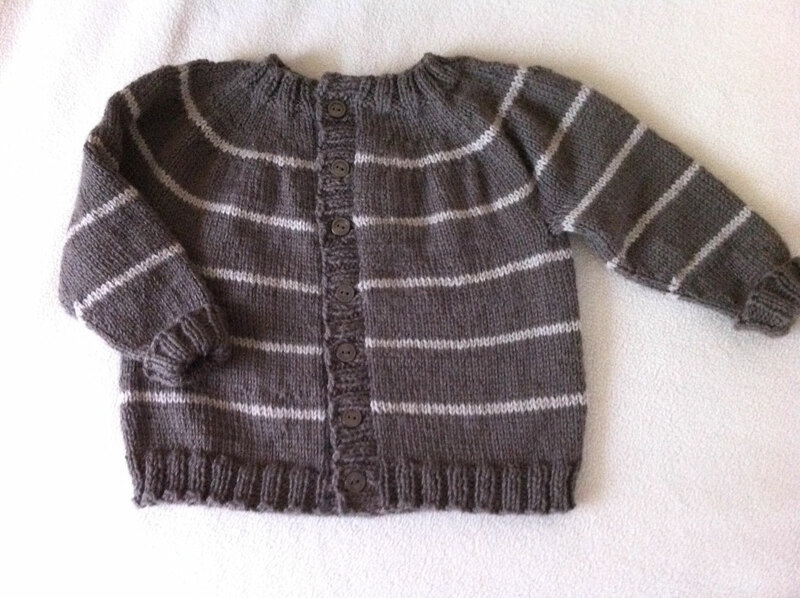 I used Elizabeth Zimmerman’s February baby sweater on two needles but tweaked the pattern a bit by increasing the beginning stitch count to 70 stitches. 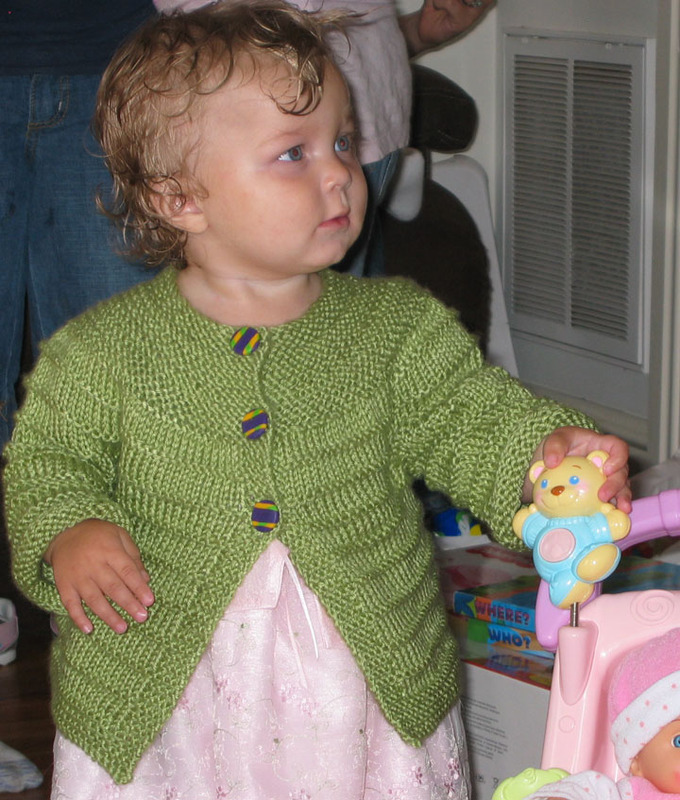 Okay, so maybe I just used her outline for the increases at the top of her sweater to make this top-down raglan sleeved sweater. Is this sweater different enough that I can post the pattern? The yarn is Louet Gems 100% Merino Wool light/worsted weight, 100 g/175 yd. I used two entire hanks of the Pewter and part of a hank of the Linen. I knit the sleeves until I ran out of yarn making the ribbing extra long so the cuff can be folded back or not. The buttons are almost a perfect match. Not that they need to match. I preferred less contrast so the stripes would be stand out more. 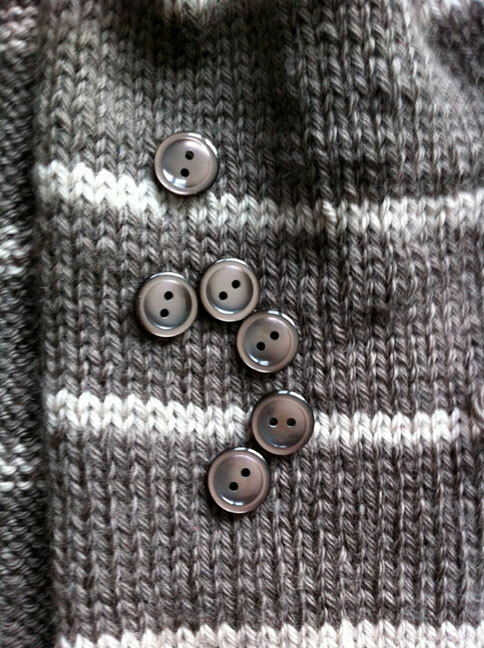 I added satin ribbon to the button side to give the button band more stability. 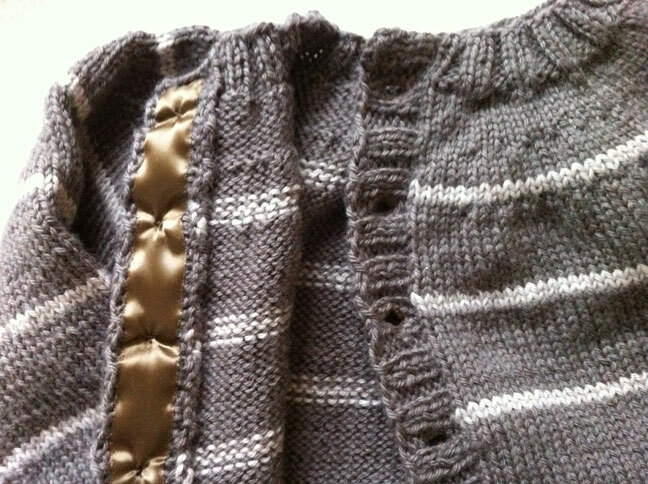 Added the same ribbon to the buttonhole side and did machine buttonholes in the ribbon before hand sewing around each buttonhole to secure the ribbon to the sweater. Of course I had to show the model. Friday evening I finished the February Sweater on Two-Needles from Elizabeth Zimmermann’s Knitting Almanac. The light spots are the reflection from the sun. I couldn’t find buttons that I liked so I ended up making some out of polymer clay. Only my second attempt but they worked. I need to play with the clay more so I can get some buttons made ahead of time and not at the last minute…like I did this time. 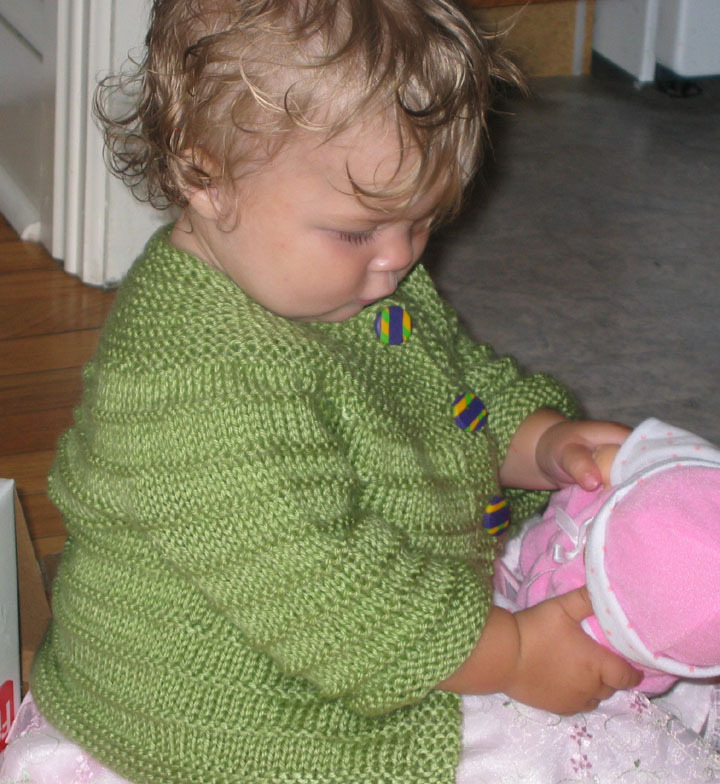 The sweater fit my granddaughter! I was so afraid it would be too small. These photos were taken at the birthday party after the cake. Jayne’s hair style courtesy of some icing mousse. 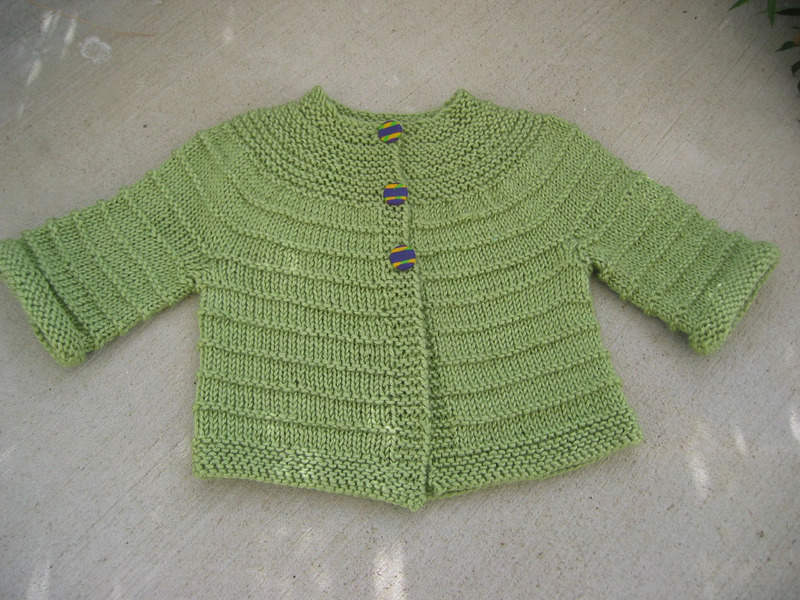 I used US 8 needles and worsted weight yarn (Caron Simply Soft). (I know EZ would be unhappy with me for not using wool.) 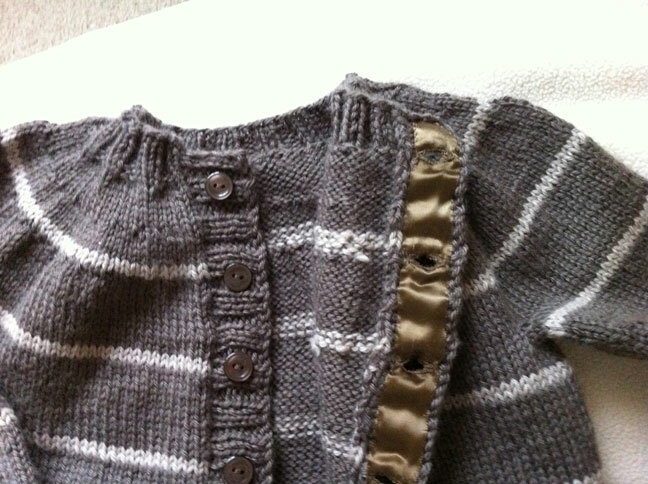 I knit the sleeves on dpns (double point needles) to eliminate seaming the sleeve. 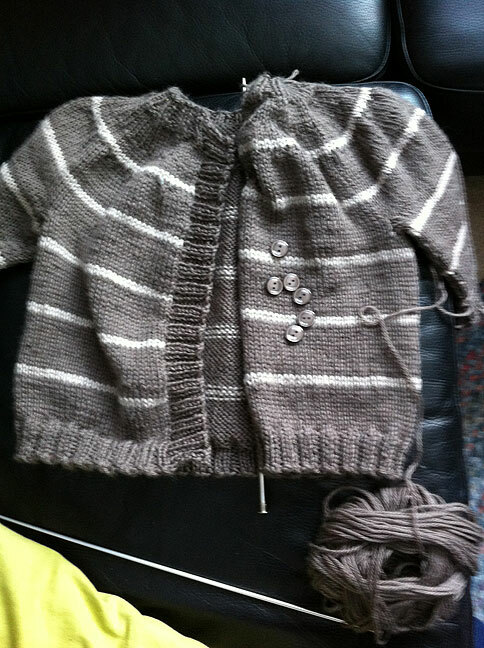 I did have trouble joining the yarn as I had a gap where the body and sleeves met. I’d really like to know how others do this. I’m not happy with the join but it worked. I went over to Ravelry and checked to see if others had trouble with this pattern, particularly the sleeve join. Some people were very upset when one questioned the pattern. I knew the pattern was vague and allowed for individuality but coming down one someone for not liking the pattern and lack of direction was just nasty.